Sat. 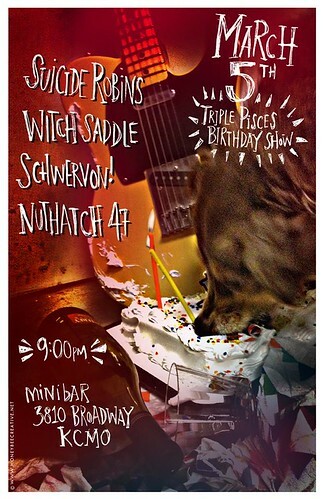 March 5: “Triple Pisces Birthday Show” KC, MO @ miniBar w/ Suicide Robins + Witch Saddle + Nuthatch 47 | Schwervon! This entry was posted in Uncategorized and tagged minibar, Nuthatch 47, schwervon live, Suicide Robins, Witch Saddle. Bookmark the permalink.